Airstrikes or minefields? This is the deadly choice facing Raqqa’s residents as fighting intensifies for control of the Syrian city. People fleeing the city and surrounding villages must decide whether to stay put under heavy bombardment or leave the city by crossing active frontlines and minefields. People fleeing Raqqa try to take all their belongings using their trucks to get to safer areas, those trucks that are usually filled with people and belongings cross frontlines, shelling, airstrikes and littered mine field. Having made the decision to leave, escaping Raqqa – known as the stronghold of Islamic State (IS) – is still fraught with difficulties. “People are punished if they try to flee, and generally manage to leave only by paying huge bribes,” says Leenders. “The road to Ain Issa was littered with mines,” says a 65-year-old man from Raqqa. Many of those leaving Raqqa are heading north in search of safety towards Ain Issa, Manbij, Mahmoudli and Tal Abyad, all within a120-km radius of the northern Syrian city. Some, however, have headed for ‘the Berm’– the border area between southern Syria and Jordan, almost 700 km away, where humanitarian assistance is almost non-existent. "Already vulnerable, their journey out of Raqqa is taking a heavy toll on their health. This is exacerbated by poor living conditions once the arrive in a place of relative safety, in the often makeshift camps." Many have been displaced several times already over the past six years of war, and come originally from towns like Palmyra and Deir Hafer. Often their health is already poor as a result of barely functioning health services, a lack of humanitarian aid, ongoing war and the closed borders which prevent them from leaving Syria. Already vulnerable, their journey out of Raqqa is taking a heavy toll on their health. This is being exacerbated by poor living conditions once they arrive in a place of relative safety, in the often makeshift camps. 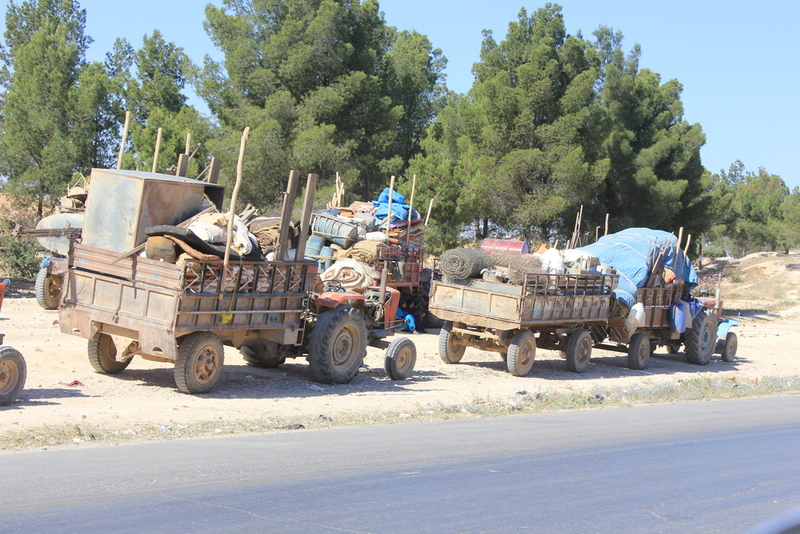 Some who have left Raqqa in recent weeks are staying in transit camps; others are camped out under the shade of trees on the outskirts of towns such as Manbij, Tal Abyad and Tabqa. “Driving through these areas, you see tents and people haphazardly scattered all over the place, with the bare minimum for survival,” says Leenders. “Most people that we see are farmers, therefore most of them either leave with their livelihood like sheep and some belongings, or they leave with nothing aside from the clothes they are wearing.” Leenders added. 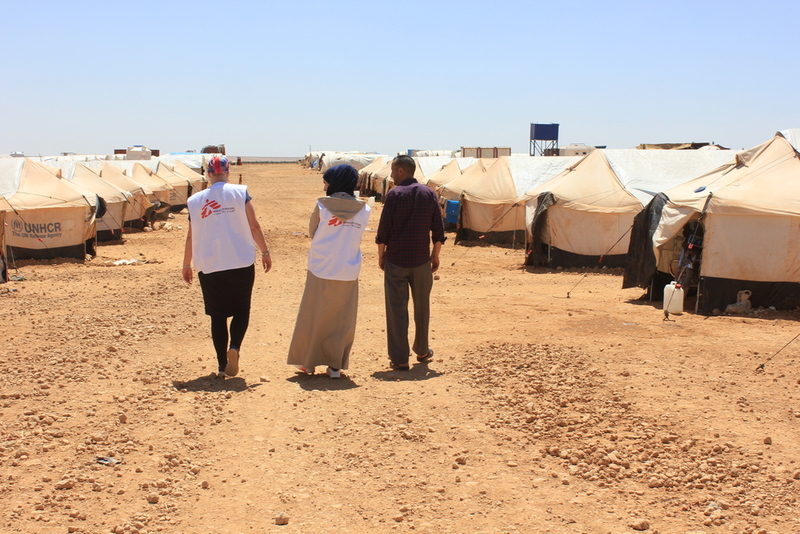 MSF teams working in Menbij camp to provide humanitarian assistance for Syrian IDPs, north Syria. MSF teams have set up clinics in camps for displaced people and are working in a number of hospitals in the area in and around Raqqa governorate, including Manbij, Tal Abyad and Kobane/Ain Al Arab. Teams are providing emergency medical care to people fleeing Raqqa and elsewhere, as well as vaccinations for children to protect them against preventable diseases and reduce the risk of disease outbreaks. In the past week, MSF teams have vaccinated 1,070 children under the age of five, many of whom have never been vaccinated before. “Most of the people we see are suffering from acute watery diarrhoea, respiratory infections and psychological complaints due to the loss of loved ones and exposure to traumatic events and the fear of being killed in these events.” says Leenders. 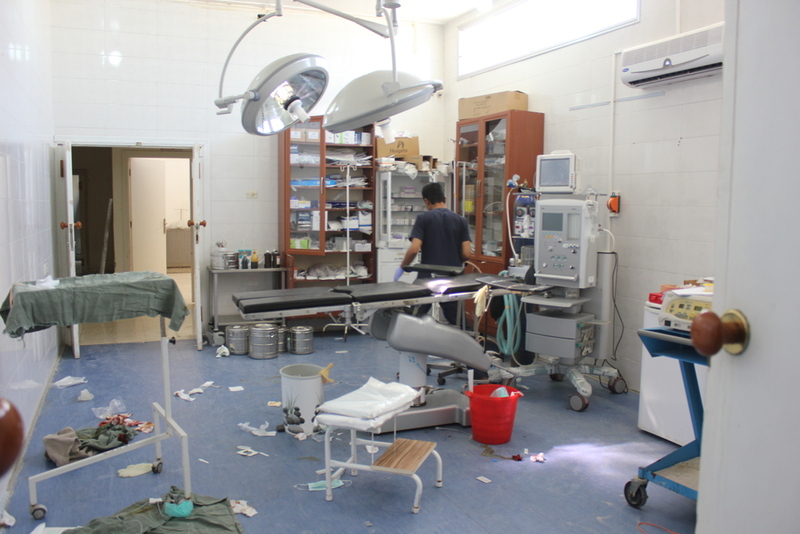 MSF is also setting up medical stabilisation units close to the frontlines to improve the chances of survival of people injured in the fighting, and to refer them to MSF-supported hospitals where trauma care and surgery is available. 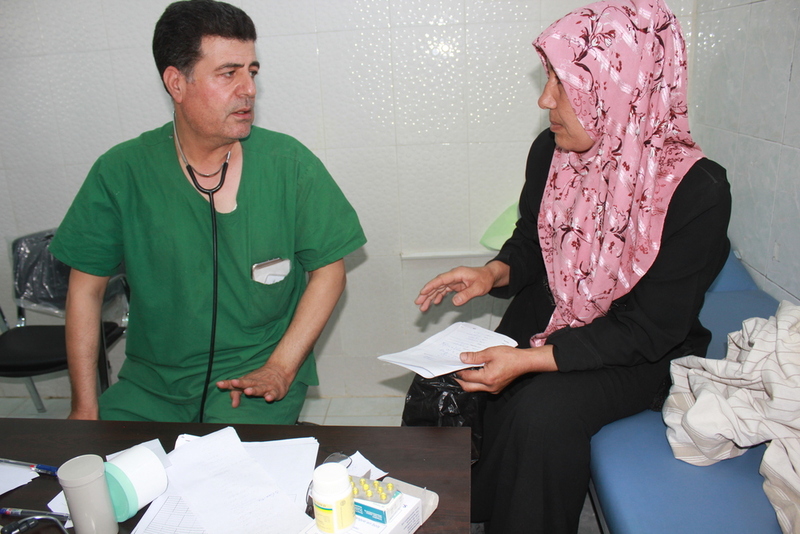 Dr. Issa in a follow up consultation in the inpatient care unit, in Menbij, north Syria. MSF calls on all warring parties and their allies to ensure that civilians in Raqqa are protected and that those who flee the city are able to reach safer areas without endangering their lives. Countries surrounding Syria need to facilitate humanitarian aid to enter and calls for humanitarian demining activities to be carried out in the north of the country. MSF also urges international aid organisations to step up the provision of humanitarian aid to people fleeing Raqqa.